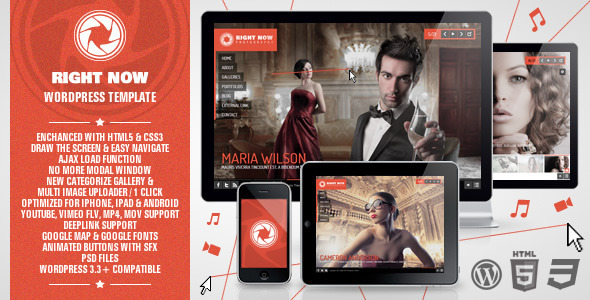 Right Now is a WordPress theme for photography or any image based site. It has enhanced html5, ajax, "no more modal window," new gallery categories, multi-image uploader, iPhone support, android support, youtube, vimeo, flv, mp4, mov, video support, deeplink support, google maps, google fonts, and animated buttons. It would be a lot easier to just tell you what this theme doesn't have than what it does.